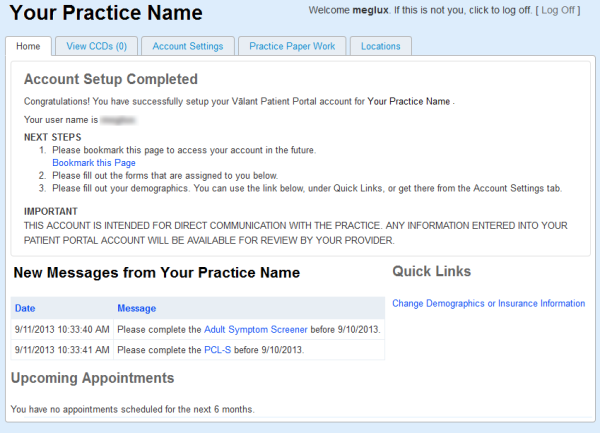 Displays contact information about the practice for you to view. Allows you to complete intake paperwork from the convenience of their own home. Allows you to gain access to copies of Continuity of Care Documents (CCDs), which will display information about your diagnoses, allergies, medications, and vital signs. Displays any upcoming scheduled appointments for you. Allows you to enter, view, and change demographic information. Allows you to enter, view, and change insurance information. Once you've set up your patient portal account, we will need you to complete information in four (4) areas: Demographic information, the Adult (or Child) Symptom Screener, Trauma Questionaire and Clinical History Questionnaire. When reviewing your Demographic Information please fill in EACH BLANK section. The "Adult Symptom Screener", "Clinical History Questionnaire", and "Trauma Questionnaire" are in the "New Messages From Oakwood Clinical Associates" section located on the right side of the page. If the patient is a child, then a "Child Symptom Screener" will be assigned instead of the Adult Symptom Screener. Please be sure to complete each page and click "Submit" once completed. If you forget your validation code or it expires, please call ( 262) 652-9830 to be issued a new code.